Looking to start a club at your school? Click here for more information! Through our club at UBC, we aim to create events that benefit the Connect Vancouver Foundation and provide valuable opportunities to UBC students. Connect Vancouver’s entirely student-run network is a great place to meet like-minded individuals who are driven to better the situation of Vancouver’s at-risk population. Scroll down to subscribe to all Connect Club UBC-related email notifications! SIGN UP BELOW FOR ALL CLUB-RELATED NOTIFICATIONS! Thanks for signing up for notifications! You're not a club member just yet, but don't worry, we'll email you reguarly with events where you can join in! For a better look at our upcoming events, click here! Join the Connect Club UBC team at a collaborative event with PartyWell UBC! Partial proceeds go directly to Connect Vancouver's mission! Click below for more information and to buy tickets today! 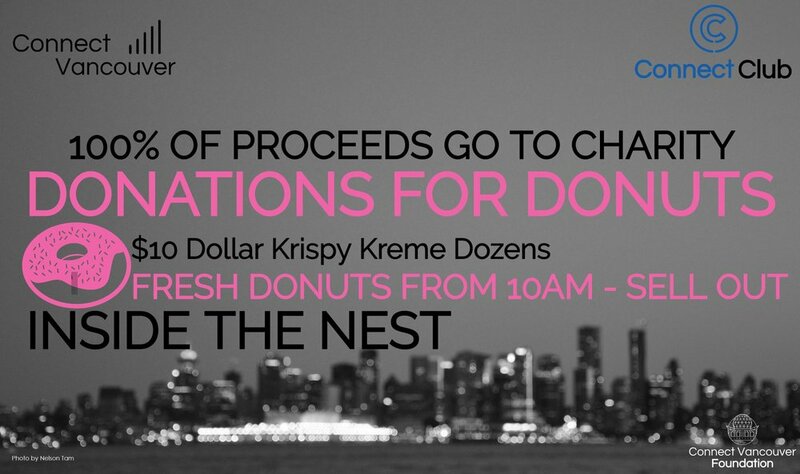 Connect Club is selling Krispy Kreme donuts for just $10/dozen! Find us inside the Nest, on Wednesday, November 22nd, from 10am - sell out! Featuring limit quantities of variety donuts and original glazed!